When I was approached by Dosh a year ago to be an influencer for them I really had no idea what the app was going to be about and whether it would even be around a year later. I was certainly wrong. The Dosh app has been extremely successful and my year of helping it grow has come to an end. It’s certainly not going to be the end of my relationship with Dosh. Like all of you can, I’ll continue to get cash back through the easy to use application, as well as referral fees (right now they are giving $15 for each friend you recommend). I look at the application often because I never know what deals are running in addition to the referral bonuses. This weekend, for example, you can get 10% cash back on everything you purchase at Sam’s Club through Dosh. I know a lot of people already have a bunch of cash back applications on their computers and phones. I definitely do. There are a lot of other good ones, such as Mr. Rebates and Ebates, but the fact is that you don’t have to pick one. I have them all! Who doesn’t need a little extra cash? It only takes a little time to download and set up Dosh, and they’ll even start you off with some free money for entering a credit card in their secure system. I find Dosh to be one of the easiest because it also works when I’m out shopping and eating. The money I get back is easy. It just gets deposited in my Dosh account right after I make a purchase at places such as Chilis, Payless, and Papa John’s. There’s even a 3% deal going on now at Mattress Firm. Finally, don’t forget that Dosh also offers great deals on hotels, in addition to getting cash back. You’ll also receive a $25 bonus for your first hotel booking. I’ve found hotel deals around the corner (Did someone say staycation?) and around the world. Now’s the time to finally set aside those ten minutes to download and signup with Dosh. While you’re at it, pass the information along to a few friends (you can find you’re “Refer” button at the bottom of any page in the app) and grab that extra $15 for each while you can. 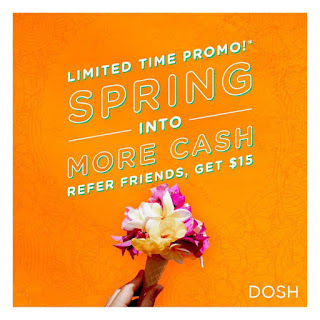 Congratulations to Dosh for helping ordinary people earn easy money for a year. They’ve given away millions! 1. Go to the App Store and download the DOSH cash back app on your iPhone, Samsung, or Google device. 2. Put in and verify your email address. 4. Link at least one debit or credit card (you’ll get a bonus for this). 5. Click the “Refer” tab at the bottom for your promotion link to share with friends. 7. Cash out your money to PayPal every time you reach $25. They money will be delivered to you in minutes. i downloaded, thanks for sharing good details.